Over the years, the University of North Dakota has had many brother combinations play for their storied program. The most recent brother combination was the Schmaltz brothers, Jordan and Nick, during the 2014-15 season. This season, UND has another brother combination, the Poolman brothers, Tucker and Colton. Both are defensemen that play in the Fighting Hawks top-six defensive pairing. During the offseason, the Winnipeg Jets wanted to sign Tucker Poolman to a professional contract. That didn’t happen and Tucker returned to UND for another season. For now, the Jets will have to wait. The Junior from East Grand Forks, MN, has some unfinished business before he leaves North Dakota. 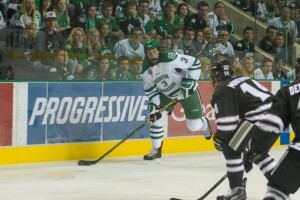 Tucker is a good student and a two-time NCHC Academic All-Conference team. He’s also on track to graduate after three years of school. There was also a chance to play with his younger brother. For the Poolman’s, UND hockey is a family affair. Tucker and Colton’s father Mark is also a member of the UND coaching staff. He’s an assistant athletic trainer and strength coach for the Fighting Hawks. When the Poolman’s are on the ice or the bench, it’s all business. Recently, I chatted with Colton Poolman. Eric Burton: How do you like playing with your brother Tucker? Colton Poolman: It’s pretty cool, just because you’ve been playing with him all the way up. You play floor hockey with him and we’re so close. Finally, we get to play together on the same team. EB: Earlier I asked Tucker if the prospects of playing with his brother played in his decision to return to UND for another season. Tucker said that there were many different factors on why he returned to UND, obviously, getting his degree was a big factor. However, Tucker hinted that the prospects of playing with his younger brother played a part his decision to return for his junior season. Your thoughts? CP: It’s different. It’s really cool… for him to say something like that it’s pretty special if that’s one of the reasons. I know he’s got his degree that he wants to work on. He can finish that up this year. There are many different factors playing in his decision. EB: What’s it like following in your brother’s footsteps to UND? CP: I think we kind of make our own path. Obviously, being his brother you’ve got to separate yourself. He’s been a great role model. He’s been a great person to look up to, but I kind of want to separate myself to a certain extent. EB: Does Tucker give you any advice? CP: He knows that I can get a little frustrated on the ice. He’s a nice calming influence. When I make a bad play and come back to the bench, he’s there to say, ‘hey calm down’. It’s the next shift kind of mentality. It’s not the end of the world. That’s what he’s taught me. EB: I’ve covered your brother for two seasons and it appears that he doesn’t seem to get all that worked up on the ice. Is he really that calm? CP: He seems like he doesn’t have a heartbeat out there sometimes. Then you see him shoot a one-timer (for a goal). When he’s fired up, he gets fired up. (For the most part) he keeps it on the even keel. That’s something that I kind of want to try and work on. EB: Your dad is the trainer, your brother is on the team, at times, does it feel like a family affair? CP: No, not really. When we’re here it’s all about the hockey. Tucker, he’s a junior. He’s one of the big d-man and everything. My dad, he’s the trainer when he’s here. Obviously, some of the lines can get a little bit mixed. For the most part, it’s more of a job mentality. When the game is over, we can have that different dynamic, too. EB: Currently, UND has five kids from the local area (Grand Forks and East Grand Forks) playing in the program. Being one of the local kids does that give you a sense of pride? CP: For sure, you can see how much the community of Grand Forks has grown. Just by all of the local kids here from East Grand Forks and Grand Forks. It gives the community more ties to the program. Makes everyone more invested and gives everyone a sense of pride.